Today is the second of a two-part series by guest contributor Tricia Stapleton, Director of the Society, Technology, and Policy Program at Worcester Polytechnic Institute. I recently wrote about incorporating a social media activity into my Intro to IR class as part of the IRiA sim. For the assignment, students developed Twitter campaigns to support their efforts to win objective points in the game. In order to prepare students for the assignment, I gave an in-class lecture on the uses of social media in politics, followed by an in-class activity on social media audience. Before the in-class activity, I gave my students a small task for homework. They had to create a Twitter account, if they didn’t already have one, and come to class with a laptop or wifi-enabled device. For the in-class lecture and discussion, I reviewed examples of social media use in politics, such as how ISIS uses social media or how social media users may be ahead of traditional news outlets in reporting events. I wanted to get them thinking about how both citizens and government can use Twitter or other modern technologies, like text messaging, to mobilize. We also reviewed how social media efforts can completely backfire or lead to satirical analyses of politics and culture. After I completed the lecture/discussion, the students completed an activity based on one that Simon shared. Students were required to find everyone in the room on Twitter and follow them. They weren’t allowed to use any form of direct communication, such as talking, messaging through Blackboard, email, or Facebook, although I did allow them to use the internet. I let them work for about 15 minutes, and then we stopped to discuss how well they had done. I was surprised to find that about 75 percent of the class had never used Twitter before, and had only created a profile for the first time as homework. I asked several students to share their methods for finding people in the room, and we followed up with a discussion about what key pieces of information needed in order to have a social campaign reach a specific or wide audience. Despite their lack of familiarity with the platform, most of the students found each other fairly quickly by developing and searching for hashtags. 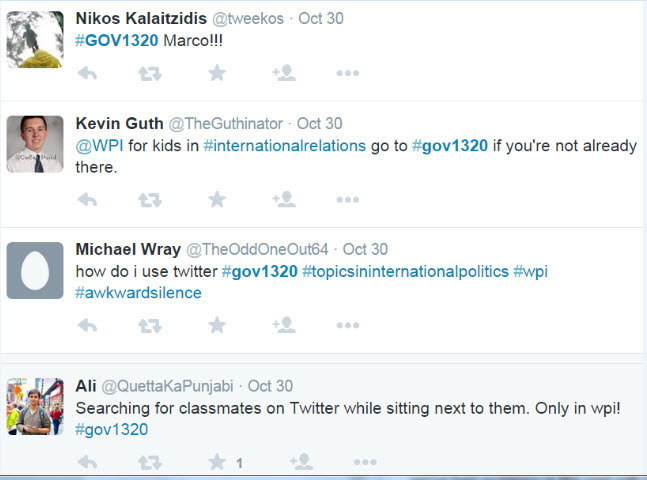 The most successful hashtag was our course number (#GOV1320). The activity was a great demonstration of the need to prep students for a Twitter campaign that they would complete for credit. It was also useful in getting students to know each other’s names and engage in discussion before they were split up into teams for the sim.